DEERFIELD, Ill.--(BUSINESS WIRE)--Baxter International Inc. (NYSE:BAX), a global innovator in renal care, announced today that the first patients have been enrolled in a U.S. clinical trial for the company’s on-demand peritoneal dialysis (PD) solution generation system. The innovative system is designed to improve the patient experience by making PD solutions in small batches in the patient’s home. The Food and Drug Administration (FDA) has indicated that the company may proceed with the prospective, multi-center clinical trial. The system brings together Baxter’s pioneering innovations in home dialysis, industry-leading drug delivery technology and expertise in water filtration systems. 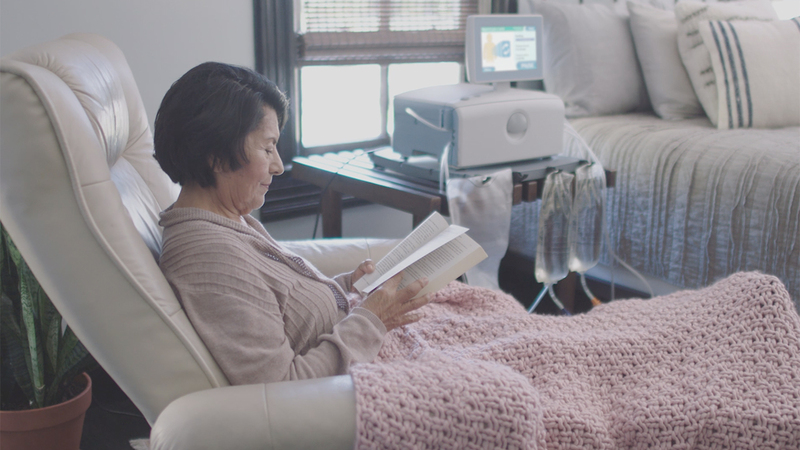 The on-demand technology uses a small water filtration device, concentrates and Baxter’s Amia automated peritoneal dialysis system to turn patient’s tap water into dialysis solution, as it is needed to complete each therapy session. Today, patients receive up to 40 boxes of pre-made dialysis solution every four weeks, weighing in at more than 900 pounds on average. These boxes take up a lot of space in a patient’s home, often filling a closet or spare bedroom. Making solution on demand allows Baxter to improve the PD experience by eliminating heavy, six-liter bags that patients must carry around their homes while setting up therapy. On-demand solutions may also drastically reduce the storage space patients need. Because the concentrate bags are smaller and can be used for several dialysis sessions, patients may also be able to reduce the amount of plastic and cardboard they recycle and dispose of daily. The innovative system is designed to be more flexible to meet individual patient needs, while simplifying how clinicians manage therapy for their patients. PD solutions are available in different concentrations of glucose, with higher concentrations removing more fluid and waste than lower concentrations. Making solutions on demand means that a physician could add or change the concentrations being used in therapy in near real-time, through Baxter’s Sharesource remote patient management system. The flexibility to adapt therapy would be a significant improvement from current practice, where a clinician manually creates a new prescription, places an order for pre-made solutions and waits for delivery, or keeps even more boxes of solutions on-hand in patients’ homes. The clinical trial assesses the efficacy and safety of the system, with each participant using the new system for 12 weeks. Following conclusion of the trial and study reporting process, Baxter expects to submit a New Drug Application (NDA) for the concentrates and 510(k) for the device to the FDA. Baxter’s on-demand solution technology is an investigative product and not approved for use. Amia with Sharesource is by Rx Only. For safe and proper use of the devices mentioned herein, refer to the complete instructions in the Operator's Manual. Patients with end-stage renal disease need dialysis to replace their lost kidney function. PD therapy is done by the patient at home, offering flexibility to choose when therapy is done. Many patients choose PD to have more time for family and work commitments. The therapy works inside the body, using the abdominal lining (peritoneal membrane) as a natural filter to remove toxins from the bloodstream. PD solution dwells in the cavity with toxins being pulled into the solution before draining. The process then repeats itself three to four times during each therapy session. This release includes forward-looking statements concerning Baxter's AMIA APD system, on-demand solutions technology and the SHARESOURCE remote patient management platform, including anticipated benefits associated with its use and anticipated timing associated with the proposed NDA and 501(k) submissions. The statements are based on assumptions about many important factors, including the following, which could cause actual results to differ materially from those in the forward-looking statements: satisfaction of regulatory and other requirements; actions of regulatory bodies and other governmental authorities; product quality, manufacturing or supply issues; patient safety issues; changes in law and regulations; breaches or failures of the company’s information technology systems; and other risks identified in Baxter's most recent filing on Form 10-K and other SEC filings, all of which are available on Baxter's website. Baxter does not undertake to update its forward-looking statements. Baxter, Amia and Sharesource are registered trademarks of Baxter International Inc.